The most common symptom of Plantar Fasciitis is pain and tenderness that can be felt at either a specific point or the whole sole of the foot. This pain last throughout the day. The pain is very severe on the initial few steps after prolonged period of rest or inactivity of the foot and is continued throughout the day. Heel spurs are also commonly seen in patients with this condition. The heel spurs are basically hard bands of connective tissue on the bony prominence on the underside of the foot. Plantar Fasciitis is basically an inflammatory condition due which it holds the benefit of not spreading to other areas in the body or even from one person to another. Keeping aside the fact that in plantar fasciitis, sometimes the calf muscle of the leg is also stretched but this inflammation stay limited to fascia ligament. The precise cause of Plantar Fasciitis is not known but it occurs possibly due to repeated small injuries of the fascia. These small injuries lead to degeneration of collagen fibers which make up the ligament. On extreme running and walking, jumping and other activities the fascia ligament is subjected to repetitive tearing and stretching which can irritate the cause its inflammation. Besides these activity based factors, changing footwear style or wearing uneven footwear can also exacerbate the injuries and irritation will lead to inflammation. However, it may also occur due to underlying diseases such as reactive arthritis and ankylosing spondylitis. Age: middle aged people between 40-50 are more likely to suffer. Foot mechanics: certain foot movements or positions such as having an irregular pattern of walking (cat walking for female models), wearing high uncomfortable heels giving a high arch to the ligament and walking on rough surfaces with flat shoes for long time can also damage the fascia. Usually during this condition, complications don’t occur but in rare cases due to consistent aggressiveness, or pressure on the ligament, it may be ruptured. This rupturing lead to further complications which include the flattening and weakening of the longitudinal arch and heel hypoesthesia. The rupture of the fascia ligament may also occur during the treatment with steroids. A complete case history is required in the diagnosis of plantar fasciitis. When the physical examination of Plantar Fasciitis done, the primary finding is the reproducing pain when plantar medial calcaneal is palpated at the site the fascial insertion to the heel bone. Pain is increased by dorsiflexion of the toes. There might a pain in the plantar fascia ligament as it moves anteriorly. Tightening of Achilles tendon secondary and occasionally contributes to pathological findings. The pathological findings in these patients are reproduction of tenderness and inflammation of the collagen fibers. A strong grip on the knowledge of local anatomy is needed for the differential diagnosis of Plantar Fasciitis as many of the signs and symptoms are similar to those experienced in Baxter Nerve Syndrome. Furthermore, a full musculoskeletal examination helps is diagnosing this condition. This examination includes range of movements of the hind-foot joints. A vascular examination also aids the physician in the diagnosis. Laboratory tests are not required in the workup of Plantar Fasciitis but they can be used to rule out other suspected diseases. Basically because this is an inflammatory condition, there would be a rise in Leukocytes/WBCs when complete blood count CBC is carried out and there might be disruption in erythrocyte sedimentation rate ESR, but they won’t be used for differential diagnosis of Plantar Fasciitis. Radiological techniques such as X-rays are only recommended when there is a doubt in identifying the heel spur and a bony tumor located on the heel of the foot, but this must be done before the treatment with steroids (injection) that is given for pain. However, imaging studies such as ultrasound are useful to monitor the treatment response in chronic cases. This can also be used in determining the extent of the condition. MRI can be reserved for rare cases such as partial or complete rupture of the ligament. Edema in the surroundings and thickening of ligament can also be identified in a MRI report. Ultrasonography is used to examine hypoechogenicity. Once a complete case history has been taken and a differential diagnosis is made, a proper stepwise, organized treatment should be directed. Basically Plantar Fasciitis is a self limiting condition; first approach like other conditions should be to perform noninvasive procedures. Empirically, it is observed that most cases of Plantar Fasciitis will respond to multi-therapy approach and the suffering will become bearable within 1-2months and full recovery can be made in 6-9 months. 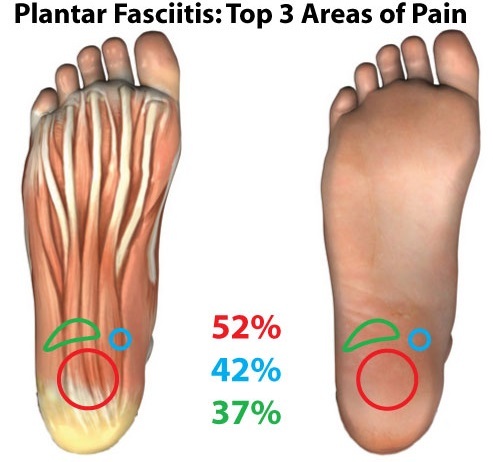 The irritation and inflammation in Plantar Fasciitis contributes the most to discomfort of the patient. For this discomfort non-steroidal anti-inflammatory drugs (NSAID’s) are given initially. They work by blocking the synthesis of prostaglandins and producing an analgesic effect and reducing the inflammation. Side by side, remedial actions are taken to provide symptomatic relief to the patient such as icing the ligament on the underside of the foot. Complete rest to the foot is not possible for an ambulant patient, therefore certain types of cushions and pads are now available to reduce symptoms associated with this condition. Night splints are commonly advised to reduce the intensity of the morning pain. These are rigid, casted ankle-foot orthosis manufactured to hold the ankle in 10° of dorsiflexion. A walking cast on the lower leg will help to restore strength and motion. Furthermore, exercises like toe stretches, calf stretches and towel stretches done all through the day especially before getting up from bed in the morning. These help to improve the flexibility of the ligament. Physical therapists are available to provide their services to such patients. Tapping practice is also another way to provide transitory relief but frequent re-taping is required for prolonged relief. If no improvements are seen in a period of 6 weeks or if the suffering becomes worse, the doctor moves up to give corticosteroids. Though these are potent drugs to provide relief from pain but the relief is only short term. Instead the injections of these corticosteroids are themselves painful, and repeated injections can damage the fascia. Extracorpeal shock wave therapy (ESWT) is only considered in refractory cases. Patients who are having a point tenderness and no associated pathology, are the ones who will respond best to such a therapy. A drawback with this is that not all patients will get relief from pain. Traditional therapy includes daily icing, stretching exercise, tapping and OTC orthosis are recommended in the initial treatment for planter fasciitis. This can be done in the first 6 weeks of the condition. Counseling is also done to keep the patient aware of all the necessary inputs he has to make in order to not to suffer from the pain of plantar fasciitis. After 6 weeks, additionally a night splint and corticosteroid injection is recommended. You have had symptoms for at least one year. The surgery performed is called ‘Plantar fascia release surgery’ and it involves cutting part of the plantar fascia ligament to release stress and relieve inflammation of the ligament. The surgery can be an open surgery or endoscopic surgery. Neuroma, a benign tumormade of nerve cells and nerve fibers. Botulinum toxin or Botox has long been used for aesthetic purposes, but since the turn of century its utility has been expanded to treat spastic conditions. There are now a number of published researches who favor the use of botulinum toxin in the treatment of plantar fasciitis. One research randomly divided and treated 36 patients with either the traditional steroid injections to the painful area of the plantar fascia or with Botox injections to the gastrocnemius & soleus muscle complex. Both treatment groups were asked to perform stretching exercises. The results of the study show that the patients who received Botox injections displayed more rapid and sustained improvement over the duration of the study. Therefore Botox injections could be effective treatment for treatment of plantar fasciitis. This will limit the side effects of corticosteroids on the body. The only drawback to this treatment is the relatively high cost of Botox injections as compared to a steroid injection. Dry Needling or Percutaneous Ultrasound Guided Approach to Plantar Fasciitis is a fairly new treatment for chronic plantar fasciitis. The advantage of this procedure is that it is a minimally invasive procedure that can be done in the office for patients suffering from chronic plantar fasciitis. It lasts for only 15 to 20 minutes. The theory of dry needling is that it breaks up scar tissue which is present at the attachment of the heel. This minor trauma serves as a stimulus, allowing the body to recognize the injured tissue as an acute problem area initiating an acute inflammatory and repair reaction. As a result, this area that normally has poor circulation will have increased blood flow. Initial results are promising and show up to 95% success rate. However more research is required as there is variation in success rate which may be due to faulty technique by some physicians as the exact rigger point for this procedure is still unknown. What is the best pain reliever for plantar fasciitis? To answer this question one must realize that not everyone has the same response to a drug. So while a drug may completely alleviate pain for some individuals, it might not have the same affect for another individual. Nevertheless the oral pain medications which are recommended in plantar fasciitis are non-steroidal anti-inflammatory drugs (NSAID’s) such as ibuprofen or naproxen. How long does it take for plantar fasciitis to heal completely? There is no fixed time for plantar fasciitis to heal because every person’s plantar fasciitis is different, so you may face shorter or longer healing time depending upon the severity of your condition. Generally, pain due to fasciitis can last anywhere from two to three weeks. However, in some cases pain can last up to six weeks because this is how long it takes for the soft tissue to repair itself. If it lasts for more than 6 weeks without any response to treatment, doctors think about employing invasive procedures. As a general rule, the earlier you begin treatment for plantar fasciitis, the less time it takes to recover. Plantar fasciitis socks or shoes. Are they helpful? Plantar fasciitis patients are advised to massage their heels and feet and to put pressure of their heels several times a day till the pain has completely resolved. However, since most of us don’t have the time to do the aforementioned treatment aids, socks and compression sleeves along with arch support shoes and/or orthotic support can prove to be extremely valuable in the treatment. They would be beneficial for anyone who sits for long periods of time, or who prefers to use them over a night splint in order to keep the ligament stretched. There have been limited professional studies proving the benefits of these compressions fasciitis socks in the reduction of pain or as a treatment option at all, however, there are many users in general who feel that it has been a worthwhile investment in their ability to reduce pain. The benefits of wearing these socks are comfortable and hence can be worn around the clock. Some people might complain that these socks are too tight. It is advised to them that they should change the size of their socks. For those of you who have experienced pain of plantar fasciitis would know the amount of limitation it causes to your daily routine. 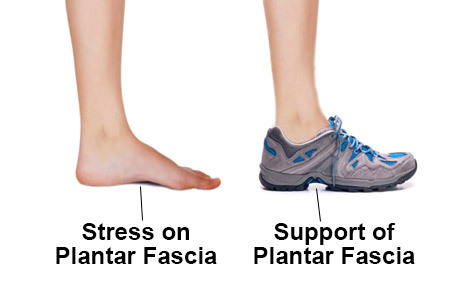 Therefore if you have experienced a previous episode of plantar fasciitis and those who are among the vulnerable population should employ the following techniques. Take care of your feet like you take care of your face. Only shoes with good arch support and heel cushioning should be used. If your profession demands that you stand on hard surfaces, place a thick rubber mat and stand on that to reduce stress on your feet. Similarly, ask your human resources department for information about different ways of doing your job and employ the method that will not make your heel pain worse. Exercises to stretch the Achilles tendon at the back of the heel should be done at least two times a day. It is helpful for both athletes and non-athletes. Consult a physiotherapist on guidance about which exercises will suit you the best. Establish good exercise habits like doing it regularly and increasing your exercise levels gradually and not suddenly. If you are a runner, switch running with other sports that will not cause heel pain. Besides these, consult a sports training specialist for conditioning and training programs to prevent plantar fasciitis from recurring. Reduce weight if you are obese or overweight. A healthy weight for your height is critical in long term prevention. Wear supportive shoes as soon as you get up. Going barefoot or wearing slippers puts extra stress on your feet which these supportive shoes do not. Stretching exercises are one of the best ways to reduce heel pain due to plantar fasciitis as they involve your feet and lower leg muscles. Exercises may also help to reduce inflammation in the calves and other so you can move around comfortably. In the morning, before you get out stretch your feet, calf muscles, lower leg muscles and toes. Hold onto your stretched feet and gently pull them toward you for 30 seconds, release and repeat 2 more times. This may be helpful to minimize your pain in the morning. You can also roll a frozen water bottle or a little ball under the arch of your foot, beginning from the front and working your way back. Apply a little pressure. Do this for a couple of minutes, once daily. They extend the shortened Achilles tendon in plantar fasciitis and improve the foot arch, hence reducing the pain associated with plantar fasciitis. They can’t completely rid a person of a foot ailment; however they can help significantly decrease foot pain. This device is not useful if the fasciitis is due to any structural deformity, therefore one should go to a podiatrist before using this remedy. There are a number of home remedies available for the treatment of plantar fasciitis. If you resist taking medicine, then the following remedies maybe used by you. Epsom salt which is basically magnesium sulfate crystals is a common treatment for plantar fasciitis. It has an anti-inflammatory action and hence reduces pain. It also helps in healing muscles and connective tissues of the body. 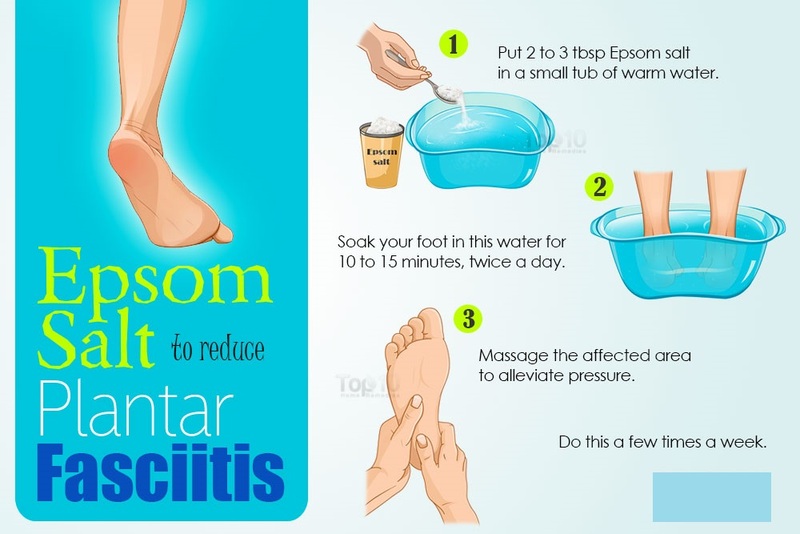 Ideal way of using it is to put 2 to 3 tablespoons of Epsom salt in a small tub of warm water and then soak your foot in this water for 10 to 15 minutes, twice a day. Do this a few times a week for maximum benefits. Turmeric contains the compound curcumin which works as a strong painkiller. It too is an anti-inflammatory agent. A study by Davis et al., which was published in a June 2007 issue of the American Journal of Physiology found that curcumin can reduce both acute and chronic inflammation. Method for using it is as follows: Add 1 teaspoon of turmeric powder to a cup of milk and heat it over a low flame. Then add half teaspoon of honey and drink it daily before going to bed. If this doesn’t suit you, you can take curcumin supplements, 400 to 600 milligrams 2 times a day. Ginger is a known anti-inflammatory and analgesic spice that can help battle plantar fasciitis. Mix 1 tablespoon of grated ginger in 1 cup of water and then boil it for a few minutes. Then turn off the heat and wait for 10 minutes. Then pass the mixture through a fine mesh and drink the tea while it is still hot. Drink 2 to 3 cups of this tea daily. Ginger can also be added in your diet. Another option is that like curcumin, ginger supplements are also available which you can take after consulting your doctor. Apple cider vinegar is a helpful health tonic which can be used for treating plantar fasciitis along with a host other morbidities. It is an analgesic, anti-inflammatory and anti-oxidant liquid. You can use this by adding 1 tablespoon of raw, unfiltered apple cider vinegar and 1 teaspoon of raw honey to a glass of warm water. Drink it a couple of times daily. Alternatively, you can mix 2 tablespoons of apple cider vinegar in a small tub filled with warm water and soak your feet in the tub for 5 to 10 minutes. Can you take Cymbalta and Tramadol together?